The Google Wave Preview has been available to one million+ people for over three months now, but questions about Wave still abound, even by the early adopters who have gotten in and taken it for a test drive. After publishing a book on everything I know about Wave, I still get many of the same questions I heard back when I started. Even folks usually bullish about new technology still don’t understand what they can use Wave for, how to sell it to their friends and co-workers so they have someone to use it with, and how to fit it into their workday. As much as I’d love it if everyone bought a copy of my book for every person they invite to Wave, reading 102 pages just to “get” a product is ridiculous. So, I’ve compiled some of the most frequently asked questions I’ve gotten about Wave and my best (and briefest) answers for them right here in quick-fire format. Step inside to hear a two-word definition of Wave, what it’s useful for, why you’d choose it over similar products, and how to do the things in Wave that most often trip up new users. Ok, I cheated a little. Wikichat is my made-up word for the combination of document collaboration (wikis) and messaging (chat). Imagine a Wikipedia page that only your workgroup can access and that multiple people can change simultaneously, with live, inline chat embedded in it and the ability to add online multimedia like an image slideshow, videos, maps, polls, a Sudoku game, video conference call, and other interactive widgets. See it? That’s Wave. A: You’d use Wave instead of email because you can have real-time, IM-like conversations inside it, and cut out the lag time of asynchronous email communication–you know, when you send an email and have to wait for your recipients to read, reply, and send one back. In Wave, if your recipient is online, you don’t have to wait. In fact, your recipient can start typing before you stop. It’s wacky. A: You’d use Wave instead of instant messenger because you can edit the same text, images, captions as someone else is at the same time. During an instant messenger conversation you pass back and forth a series of single-author, uneditable messages. In Wave, anyone can edit any message (or blip, in Wave-speak). Imagine correcting someone else’s typos during a chat yourself, without pointing out to them that they mistyped. In Wave you can drop multimedia like image slide shows, YouTube videos, Google Maps, and countless other gadgets that you can’t in Google Docs. Like a wiki (and unlike Google Docs), you can link waves to each other very easily. The following are questions I’ve gotten from people already in the Wave Preview, trying to figure out how to use the system. Q: Now that I’ve gotten into the Preview, how do I invite other people in? A: Search for a wave called “Invite others to Google Wave.” Enter title:"Invite others to Google Wave" into the search box, and press Enter. One wave with only you as a participant on it should turn up. In it, you can enter the email address of the folks you want to invite. If no wave gets returned, be patient! Google may not have doled out nominations to you yet. Save your search to check back later by clicking the Save Search button on the bottom of the Search Panel. Q: How do I use Wave if no one I know is ever online while I am? A: To experience the real-time magic of Wave even if your friends aren’t online, search for public waves in action using the with:public search operator. Select a wave at the top of the list of results, and watch as others type into it–then jump in yourself. Q: How do I make a wave public? A: The easiest way is to use the Easy Public bot. Add easypublic@appspot.com to your Contact list, and then drag and drop it onto any wave to make it public. Q: How do I see the next unread blip in a wave? A: Press the Spacebar. In a big wave with lots of unread blips in various locations, the Spacebar will take you to the next unread blip in one press. Q: How do I publish a wave in a blog post? A: Right now the Madoqua Bot can give you the embed code for putting a wave on a public web page. Add Madoqua to your wave to get started. Remember, though: the people viewing your blog post or web page will have to be logged into Wave to see the embedded wave. Otherwise they’ll just get a prompt to log into the Wave Preview, which is frustrating for people who aren’t in Wave yet. Q: How do I remove a Wave contact? A: To remove a contact from your Wave contacts list, you’ve got to do so in the regular Google Contacts interface. Click on the Manage contacts link at the bottom of Wave’s Contacts panel. Here’s how to remove a contact step-by-step. Q: How do I remove a participant from a wave? A: You can only remove bots from waves–not regular users. Yes, this is crazy and needs to be fixed stat. Here’s more on the inability to remove participants from a wave. Q: How do I link to another wave inside a wave? A: You can create a link to a wave in another wave by simply dragging and dropping the destination wave from the search panel onto the linking wave while you’re editing it. Make sure all your participants have access to the linked wave, otherwise they won’t be able to open it. To link to a wave outside of Google Wave, first open the wave then minimize your Search panel. Copy and paste the link in your browser’s address bar–that link will open that wave with those panels minimized for anyone who clicks on it, is logged into Wave, and has access to that wave. Q: How do I set my Google Wave icon? A: Click on your name at the top of the Contacts panel. From the profile pop-up, click the Edit profile button. A special profile wave opens, and there you can upload an image that will appear as your icon whenever you participate in a wave or appear in others’ Contacts lists. Q: How do I remove a gadget from a wave? Q: Since my friends and co-workers don’t use it every day, I forget to check my Wave inbox. How can I get notified when waves are updated without logging in? The Google Wave Notifier (Windows only) is a system tray application that notifies you when you have unread blips in waves. The Google Wave Add-on for Firefox notifies you of unread waves in Firefox’s status bar. Now I’ve got questions for you. 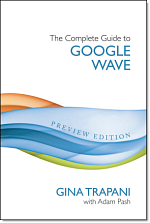 I’m working on the next edition of The Complete Guide to Google Wave, and I want to know: what do you want to see get added to the book? What burning questions did I miss here? How are you using Wave day-to-day–or what’s stopping you from doing so? Post your thoughts in the comments, and thanks in advance for your help expanding the book. The JetWave Jetpack notifier is pretty good too. I would think the most frequently asked question about Wave is “Is anybody still using it?”. I don’t know anyone who’s even vaguely interested in it now the hype has died down. For those who use Google Chrome(or Chromium)with extensions, I’d recommend One Number(http://goo.gl/ivnQ), it checks gMail/gVoice/gWave/gReader all at once, and you can tweak it quite nicely. It’s the first extension I ALWAYS install. Thanks for your manual on Wave, Gina. I found that after I had read it, played on Wave for a few days and now I’m reading it again it makes more sense. No, I don’t watch TV. Any idea when Wave is going to speed up a bit? Using it is pretty frustrating. For non-techies, I’d call Wave “instant e-mail collaboration”. “Multimedia wikichat” encompasses more of its features, but e-mail gives it something more people can relate to. You write that wave can be used to create surveys in. In see was as way to unstructed for polls/surveys unless you have some gadgets for it. As an architect, I would love to understand more about Wave architecture. Topics might include federation, API, clients, embedding wave in other apps, etc. Another idea – how to use wave in the context of the enterprise. For the iPhone it provides Push Notifications. For the Mac it provides a system conform integration to the status menu and Growl Notifications.